With their unique ways and fickle preferences, it’s no secret that cats can be a little weird. But sometimes, that strange thing your cat does is actually a medical problem. Take, for instance, feline hyperesthesia syndrome, sometimes called twitch-skin syndrome, rippling-skin disease or rolling-skin syndrome. A cat with hyperesthesia may lick at her back, flank area or tail. Photography by DoraZett/Thinkstock. 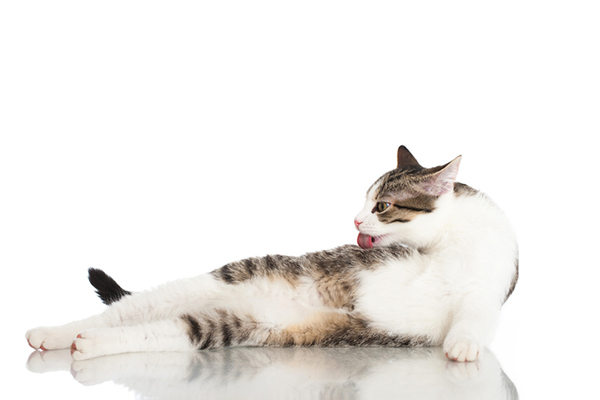 “Cats with hyperesthesia syndrome are extremely sensitive to touch in the lower back region,” says Michelle Murray, DVM, MS, Dipl. ACVIM (Neurology), CCRT, owner of NEST Veterinary Neurology in San Clemente, California. “Touching this area can cause them to suddenly vocalize, salivate, scratch, bite or lick at their back, flank area or tail, or even urinate. The skin along the back appears to twitch or ripple. They can be agitated and often run frantically around the house for about 20 to 30 seconds until the episode stops.” Cats generally go back to acting normal after an episode passes. Feline hyperesthesia syndrome is extremely rare. Dr. Murray says that even in her neurology-only practice, she does not see feline hyperesthesia syndrome often. But for those cats who are affected, feline hyperesthesia syndrome can be troubling, especially for felines who self-mutilate in an effort to curb the uncomfortable feelings caused by an episode. Feline hyperesthesia syndrome can affect cats at any age, although it’s more frequently seen in adult cats. Any cat breed or mixed breed can be affected. If you notice your cat exhibiting symptoms of possible feline hyperesthesia syndrome, schedule an appointment with your regular veterinarian, who will examine your cat to look for other causes for the symptoms, such as an injury, skin disorder or flea infestation causing severe itching, or painful condition like orthopedic and spine or nerve problems. If your vet cannot pinpoint a cause of the symptoms, the next step would be to consult a veterinary neurologist for another exam and more tests. Tests that your regular vet and/or veterinary neurologist might want to run include basic lab work; skin scrapings, biopsies or cultures; X-rays; and possibly advanced imaging such as MRI. “With feline hyperesthesia syndrome, all of these tests can be totally normal,” Dr. Murray explains. If no other specific cause can be identified, the veterinarian might arrive at a diagnosis of feline hyperesthesia syndrome. Know that it might take some time to go through the process of testing for and ruling out the various conditions that might be causing the symptoms. Although the exact cause of feline hyperesthesia syndrome is still a mystery, since many veterinarians believe it to be a seizure disorder, treatment involves using medications. 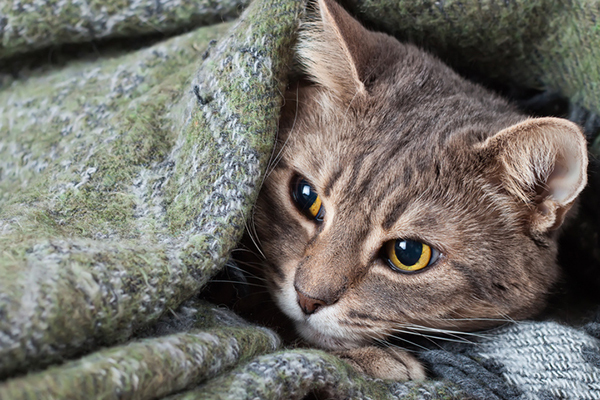 Tell us: Does your cat have feline hyperesthesia syndrome? How do you deal with feline hyperesthesia? Thumbnail: Photography © zlyka2008 | Thinkstock. Would You Donate Your Cat’s Body to a Vet Education Program? My 7 year old, Tinkie, woke us up last night yowling as if she was on heat (she was spade at 8 months). She was staring at a corner of the room, growling and looking terrified. I couldn’t see anything, and the other two cats were upset by Tinkie’s behaviour but not concerned about anything else in the room. She was right next to me so I stroked and chatted soothingly to her. After about 5 minutes she calmed down a bit, but it took a good 15 minutes for her to calm down completely. In the past year or so I have noticed that she seems to be “seeing” things. She has always been nosey, but these investigations did not seem normal. Should I be worried? Other than this, she is pretty much the same as usual. Overly attached to me, Mother Hen to her sisters, grooms slightly more than the other two, grooms her sisters, very much an indoor girl and my “good girl” in that she goes about life without doing too much of normal cat like “naughtiness”. Thank you. Will get her to the vet for a good general check up. My cat had feline hyperesthesia, and after searching for the cause and a solution for years I discovered (through trial and error, mainly) that it was not diet related – at least in my cat’s case. Instead, it was a result of the use of Paradyne (Revolution) flea drops. This medication kills fleas using a neurotoxin that can cause neurological symptoms and hyperesthesia as a side effect in sensitive animals. When I stopped using the flea drops, the symptoms gradually receded. *Please Note: It did take several months for the symptoms to completely disappear, but they began to get noticeably better after the first missed dosage, and continued to improve until there were no more visible symptoms at all. Not sure if this syndrome can be caused by other flea meds, as well.﻿ In any case, it’s worth a try if your cat is suffering. I have had my 7 year old since she was 3 days old. Her mom obviously “dropped” her off and some people found her and brought her to the local animal shelter. I raised her, and while she was a mean kitten, didn’t seem to start having the hyperesthesia until much older. My vet sent me to a cat neurologist and Sissy is now on 25 mg. Gabapentin twice daily, 25 mg. Zonisamide twice daily, and 1/4 tablet Amitriptyline (10 mg. per whole pill) once daily. It isn’t perfect, but she is much better. When she starts her “episodes”, as I call them, I can usually distract her with a laser light or some other toy to distract. I’ve tried weaning her off the Amitriptyline, but she started getting worse, so we’re using it again. I don’t know that there is a perfect solution. As long as she’s happy, I’m happy! My cat has hyperesthesia and it is due to flea medicine toxicity (she ingested some of it and we had to flush her system with water and she almost died). She has tremoring (shaking her feet or thumping them on floor like Thumper) and she chews her nails down constantly. I distract her when I am home. I also have to separate her from my other two cats (one is her brother) because they seem to stress her out/bully her (her episodes increase if I leave the oldest out with the two siblings as he does bully her and her brother). Keep it stress-free is my advice. If you leave music on, try to search for binaural beats for cats on youtube to soothe. I use CBD oil for her brother’s UTI/gut inflammatory issues but it is too expensive for me to use on both of them, so I haven’t tried this yet (she is also picky). ALSO — KEEP FISH OUT OF THE HYPERESTHESIA CAT’S DIET BECAUSE FISH/MERCURY AFFECTS THE NEURO SYSTEM AS DOES HYPER ESTHESIA. I NOTICED WHEN I STOPPED BUYING FOOD WITH FISH OIL IN IT (STICK TO WERUVA PAW LICKIN’ CHICKEN, QUIRKY TURKEY, OR OTHER CHICKEN FLAVORS!) HER SHAKING SUBSTANTIALLY DECREASED. I have been giving my 10 year old girl CBD which seems to help most of the time. She started showing symptoms about a year ago. Anyone else use CBD to help? I just started using CBD for my 5 year old, but it actually doesn’t seem to help. I give 2mg treats from Holistapet twice a day. He also gets 50mg gabapentin 3x a day. His problem is exhibited mostly in the morning and other times before meals … I wonder if hunger has something to do with it. my Callie developed feline hyperesthesia at about 2 yrs old. I noticed that she would have these episodes of chasing her tail, eating things that are not there (hallucinations) and she would attack herself as if she was flea infested, but she has no fleas. She picks at her ears until they are all ripped and bleeding. My vet had no idea. I was a year searching on the internet until I found this condition, Feline Hyperesthesia Syndrome… That was lik3 hitting the jackpot! I printed the info and brought it to another vet. I told her my cat had all the symptoms of this condition. By this time I had already started to treat Callie with kid love! I also had a cone on her head so she couldn’t scratch her ears. I cut the cone down and put a colourful border around it. I cut it down enough so she can eat and clean herself as best she could. After each meal my husband or myself would sit down and put her on our lap and take the cone off. She would clean herself sometimes for an hour. Sometimes she would go weeks without wearing the cone because about 60-70% of the time … when she feels an episode coming on … she runs to me and i pick her up and just cuddle her for however long she needs. So my vet said that what I was doing for her was better than meds and to keep on doing it. Her sister, Tabby, does not have the condition. My question to you all is: Is there a special diet or certain things I shouldn’t be feeding her? And what’s th3 best cat food for her and could it help? Maybe leave a TV or radio on. I do this for my little guy. Seems to sooth him. I put YouTube on for my cats called calming your kitties music they love it. My Inky is three and just deleveped this hyperthesia so I give him CBD oil for pets it works for him ???? My cat started showing signs of this around 1 year, she’s 8 meow. The vet at the time put her on anti anxiety meds and they didn’t work for her. So I started putting a sweater on her to keep her from reaching her tail while I had it bandaged (she has torn it up really bad at times) and that sees to make a huge difference. She still displays symptoms regularly but I can usually distract her with her Mousr toy (or other things) but if she is persistently going after her tail, I put her sweater on her and she calms down right away. Where’d you get the sweater? My cat has several episodes daily. It just started a month ago. Kid department! Size 0-3months seems to fit a small-medium cat! My 10 month old boy physically attacks his tail. He has ripped the skin. He has a ripple above his tail right before he goes into attack mode. I know it’s drastic, but would amputating the tail calm this? We suggest talking to your vet about your cat’s behavior. I’ve heard of other people doing amputation and their cat is still able to attack the part that has remained because the vets can’t amputate the entire tail. There will be a stubby tail left and your cat will still be able to reach it and damage it. Like I said in my post, I’m able to help Luna by distracting her with toys or putting her sweater on. The sweater may not work for all cats and it doesn’t work with her all the time because sometimes she’s able to slip out of it and of course bite the bandages off and then lick her wounds until they are all open and bleeding again. I’ve been dealing with this for 7 years and nothing has been 100% yet. But I haven’t tried any anti-seizure meds. maybe those would work better than the anti-anxiety ones she was on. My cat has daily episodes. I’ll look into these treatments. Hi my cat recently developed small scabs on her back mostly near her tail (its not fleas or many of the other items listed here; only possibility could be stress as we just moved down the street). Whenever I pet her in that area (even before the scabs) her skin/fur absolutely ripples like mentioned above. She doesnt do anything crazy but it does seem that that feels uncomfortable for her. Does that mean she has a very minor case of HS? Would it have anything to do with the scabs? She is a pretty major groomer but I’ve never seen her groom in that area. I know I can bring her to the vet and will if it gets worse but if anyone could reply about something I can do BEFORE a vet visit I would appreciate it (also I have read about 20 articles on the site so links to other pages isnt going to help). I do appreciate the info and accept advice as at my own risk as I know you don’t want to reply and have something happen to my cat worse than the small scabs (not extremely worriesome at this point; just trying to get ahead of it if need be) there. My cat takes a small dose of Phenobarbitol. He still has some episodes, but the higher doses can be toxic. It’s worth discussing with your vet. Re: St. John’s Wort — Please check with your veterinarian or a holistic veterinarian before using any herbal supplements. You do know that St John’s wort is poisonous to cats right?!!!? I just read on “Healthy Pets” where a vet said this: “I’ve also had good success with kitties using homeopathic Aconitum and Hypericum orally to help dampen emotional and neurologic reactivity that can lead to physiologic symptoms.” I believe Hypercium is St. John’s wort. My cats fur starts twitching when I put him on a certain red blanket. He would stand there twitchng than jump off and run around. The blankets usually on my bed and when I put a tan blanket over the red one he lays down. He used to love the red blanket. He’ll just sleep on it whenever he sees it. What’s wrong with my cat!? My male cat has this disease. He had 2 seizures when he was younger and still sometimes chases his own tail / randomly will start talking to himself. I read somewhere feeding them tuna makes this disorder 10x worse. Since I stopped the tuna, his seizures stopped as well. He still gets that scary glazed look in his eyes (like the Shark from Finding Nemo) where his pupils fully dilate. Calming treats are working wonders for him as well. In May of 2012 the local SPCA had an open house on kittens and we picked a brother and sister. (One long hair and one short hair) A year or so later we noticed erratic behavior of the male. We live in the mountains over 50 miles from a vet so did our due diligence on the Web. Everything indicated Hyperesthesia. The more we read convinced us we had the right condition. As we live above 3500 feet in the mountains there are no fleas. The cats have been indoor cats since day 1. His seizures are quite regular ,usually 1 or so a day. They do not fall in the severe category and there is no hair pulling. I think that at least for us the fact that his surroundings are quiet has a lot to do with his well being. Best wishes to those of you that have a buddy with this. Lots of love and care have gone a long way for us and ‘no meds needed. Finally, after four vets, found one that was actually willing to help her. She is currently on phenobarb and gabapentin and her attacks have lessened dramatically. I was reading the other comments of a few attacks a year. My cat was having bloody attacks almost every other week before we found a vet that would listen to us. (Funny how the other four didnt care she was ripping herself open and claimed it was a single flea). What all has your FHS cats been on medication wise? We are still trying to work out dosages and she is building up a tolerance very quickly to pheno and gaba. Prozac (fluoxetine) helped my cat w/ FHS. She had been on pheonobarbital for years, then changed to Prozac. This was in the 90’s, though & I don’t remember the reason for the change. Praying for you & your kitty. My sweet yellow eyed tangerine angel baby Nala :( I noticed a few years ago that she was running around the house acting very strange, I mean usually she does this but I know shes just goofing around but that time she was running and stopping and licking herself very aggressively and panting very hard and breathing hard. Her little nose and ears were bright red and hot. She wasn’t aggressive but she growled at me when I tried to see what was wrong but no hissing or scratching, I think she was confused. This happens a few times a year since then and each time I am worried because I cant help her. She is also almost 8 years old. Ive watched videos of cats with this syndrome and done some research and I am positive this is what she has. I am glad I can put a name to this problem but I am upset as to why she has this. In the summer she ripped a chunk of fur from her paw because of this. If these symptoms resemble this disease, I would greatly appreciate some advice, I love my baby ball Nala with all my heart. My cat is four years old and was rescued ast a 3.5 week old. He was bottle fed with kitten formula ( which we did not know even existed). As a result, our cat never imprinted and learned all cat skills. There have been four major episodes of intensified symptoms of feline hyperesthesia involving self injurious tail biting. In between these episodes, he is experiencing back ripples in the skin,air bites at his tail, and running as if something invisible is chasing him. It has been a long journey since his last major incident in which we realized separation anxiety is the essential trigger. There is an overall of physical and neurological component which is difficult to manage. This poor guy was not living a high quality of life at one point recently and that created major discussions. At one point he had bitten his tail, while we were at work and was so anxious that he had peed in the closet ( which is unheard of for him). Reluctantly, we acknowledged that he needed medicine beyond our homeopathic approach and we rely on the Thunder jacket, which is essentially a cat swaddle. He is on the road to maintaining a healthy life and we long for medicines for pain and anxiety to slowly be phased out. We have found that zyklene ( homeopathic) is a positive factor for Him as well. I have found for all of my research, there is not one thing that will facilitate your cats wellness with feline hyperesthesia and for a bit on our case… giving him the medicine was another anxiety trigger. Good luck all! My five year old cat has Hyperesthesia. I got a Thunder Shirt for him and a few months later started him on two daily doses of CBD Hemp oil. It is managing his symptoms and I only need to put his Thunder Shirt on him now and then, a few times a week, usually when his morning dose of CBD is late. I began learning about CBD hemp oil on the facebook group CBD OIL for Pets and then on other sources. CBD Hemp oil contains only trace amounts of THC so he is not “stoned” . I much prefer that he takes that rather than the various prescription medications that are prescribed for the condition. My senior cat has hyperesthesia. The vet prescribed prednisone for a short duration and gave me phenobarbitol to administer if the seizures became more frequent. At the present time, she has intermittent seizures so I have not had to give her any meds. She eats and drinks water, uses the litter box and basically sleeps all day. My only concern is that she has developed mats on her back where she can’t reach and can’t be touched. I may have to resort to taking her to the vet to be sedated so the groomer can remove/shave the mats. I have a cat with hyperesthesia and was feeling lonely in the feline world. then I opened Catster and ran into this article. Daisy is on phenobarbital and is a much happier kitty for it. She’s not doped up, but relaxed, playful and loving. I think her sister, Lilly, has it too, to a lesser extent and I will soon talk to her Vet about possibly medicating her, too. This disorder made my cat miserable. She wanted to be loved but she was so sensitive to touch it was torture for her – like bitten by a dozen mega-fleas. If you suspect your cat has it, please take her to the vet and have her checked out for other problems as well as a solid diagnosis. 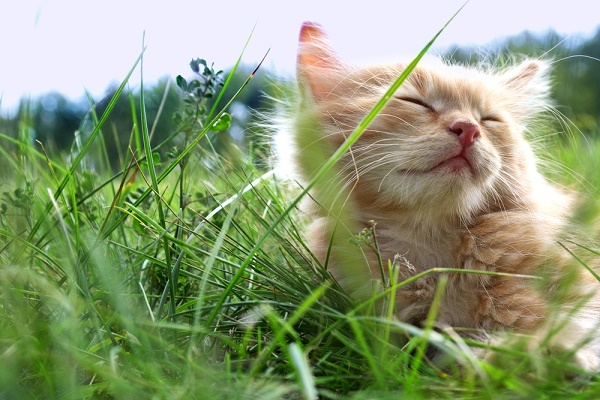 St. John’s Wort is actually poisonous to cats. We once had a cat that I was sure had hyperesthesia. She was not domesticated, but we still fed her and tried to care for her when she was around. There were times when she would run frantically throughout the yard, almost desperate to make the itching and/or pain go away. She would meow-cry at times in discomfort. You could see she would start to get pretty frantic. After much research, I finally got some St. John’s Wort. When I fed her, I would put a teeny drop into the food that she would eat. I repeated this process until it seemed she was no longer ailing. The St. John’s Wort did the trick. It is like it got rid of it completely somehow. I would highly recommend this treatment. Can you tell me how much is a tiny drop?I would like to try it on my kitty.